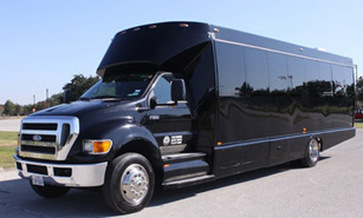 When you need or want to travel and party in the ultimate transportation has to offer, there’s nothing like traveling in one of Hamilton Limo’s chic, amazing, and perfect party buses! We make an otherwise redundant night, extraordinary with our customized service and options. We accommodate large parties up to 80 people, and can certainly make one night go down in history for your friends and family. We cater to bachelorette/bachelor parties, weddings, birthdays, prom, family reunions, a night on the town, and more. Really, there doesn’t have to be special reason to celebrate to rent one of our ultimate party buses…not if you don’t want one. We guarantee to give you an unbelievable experience and ride full of adventure, comfort, and state-of-the-art interior options. 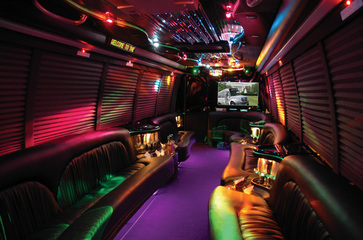 Inside each of our party buses, we have custom leather interior. We even have alternative interior options to fully match any theme or colors you may wish to represent. We also have sound systems, stereos, TV channels, DVD’s, and special lighting available. We can decorate your interior to go along with a baby shower theme, a wedding, or anything else. If you’re feeling extra crazy, we offer other interior options which are perfect for bachelorette/bachelor parties. We customize any food and beverage bars and promise to deliver whatever atmosphere you desire. Just give us a call or fill out the form for more details on any service you may be interested in. When you arrive to whatever venue or event in one of our party buses, you, your friends, and family will certainly shine like full blown celebrities. You’ll feel the love and envy from onlookers, and definitely make a lasting impression. We offer the convenience of traveling together with all your friends and family. Whether it’s to a wedding, or a girl’s night out, we can help recommend local hot spots, clubs, fine dining, and more for your evening of events. 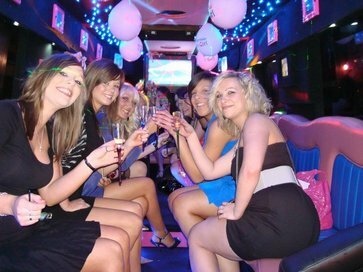 Party buses are great for any type of occasion. When you all travel together, there’s no need to worry about who drives with who, or does so and so have the right directions, nor do you need to plan a designated driver. We take the frustration out of planning, and give you the satisfaction and luxury of mingling with friends and family, without anyone worrying who’s going to drive. With everyone arriving and departing together, you save valuable time, and spend more time partying and celebrating. We have the best in luxury. Our vehicles are equipped with every high end feature possible. When you travel, you’ll do so not only in style, but in comfort. We definitely strive to provide a positive and exhilarating experience for all our customers when they book with Hamilton Limo. We have been serving clients in the Hamilton area for years, and know how to show any party a good time. We work closely with you to plan the itinerary, and provide any helpful tips to make your event much more memorable and exciting. It doesn’t matter if you’re anticipating a party of 2 or 80 people. 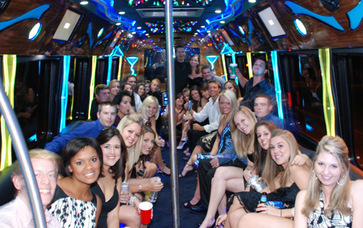 Our party bus is a great way to start off an unforgettable night. There’s no better time than now to call us or fill out the form if you’re interested in Hamilton Limo services. Unlike other corporate limousine services in Hamilton, we are prompt and get back to our clients quickly and efficiently. When you need or want to travel and party in the ultimate of transportation vehicles, there’s nothing like traveling in Hamilton Limo’s chic, amazing and perfect party buses!